So... I've been trying to come up with ideas for a contest or give away... and I've GOT IT! 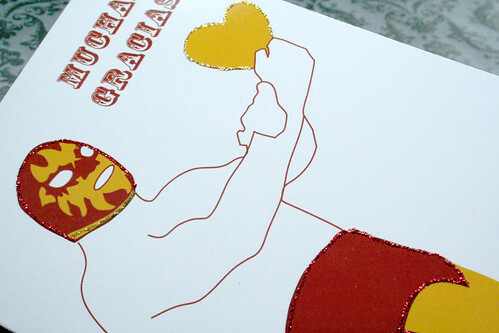 In the spirit of the upcoming Thanksgiving holidays I want to offer THREE lucky winners a set of Luchador Thank you cards. Each set comes with 6 cards hand detailed with a bit of *sparkle* and 6 envelopes sealed in a celophane envelope. 2) Leave a comment on what you're thankful for this season by November 15th. Click on the blue text that says "Comments" or "Post Comments" at the end of this post. That's it! I'll post the winners on November 16th! I am thankful for my wonderful husband who takes care of me and our little Mateo Cosnean O'Leary! thankful for my family, friends, and people who still make things with their own two hands...! the handmade labor of love gives me faith in a pretty bleak looking world. that you do ~ often! I give thanks to have been blessed with awesome parents, lots of siblings, a wonderful husband, 2 beautiful kids, and a ginormous extended family. There's never a dull moment, especially during the holidays!